The Civil War was fought over very specific issues, the principle one being slavery. Many of the false ideas that had to be eradicated in its wake had to do with race. 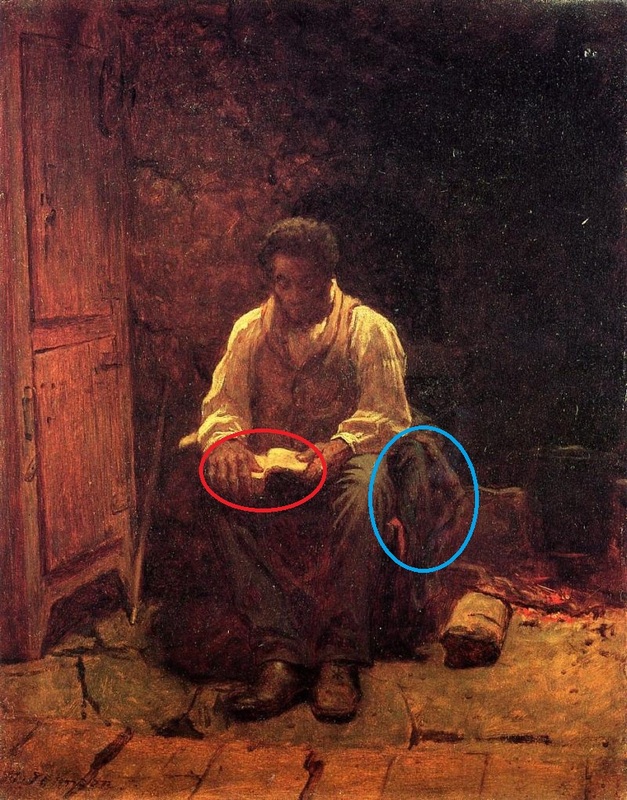 As a result, a lot of artists depicted scenes that would turn racist ideologies on their heads. These scenes were unique to the Civil War, but one trait that is demonstrated in the remembrance of almost all wars is the horrors of battle. Humanity generally turns from violence and abhors the drastic measures taken during war and the terrible losses sustained. That is a common theme in any conflict. Eastman Johnson was born in 1824 in Maine. Raised in the North, Johnson traveled across the region in the 1840’s earning money as a portrait artist in various cities. In 1849, he went to Europe to learn from master painters there and was considered very talent in the countries he visited, from Germany to Italy, France, and the Netherlands. He returned to America in 1858 to set up a studio in New York. Upon his return to the United States, Johnson began a period in which his art centered around bringing attention to the plight of blacks in the South, and he received many commendations for his work at this time. 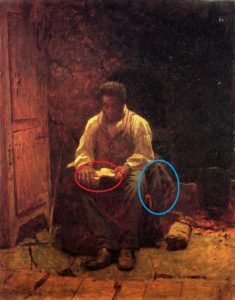 One of Johnson’s more famous pieces of art The Lord is my Shepherd depicts a black man sitting in a darkened room reading his Bible. The man’s face is gentle as he reads from the holy book, giving him a pious appearance that was at odds with the classic view of blacks for many at the time. At his side is a Union army blanket, showing his loyalties and the righteousness of the Union cause. Johnson’s art served to give a message to the nation. He wanted to show a side of black Southern life that was not at the forefront of many American’s mind. His art was not just aesthetic, it carried a purpose as well (Harvey). James Hope was born in Scotland in 1819 but moved to Canada after his mother’s death. It is unclear when or why he moved to Vermont, but he ended up there when he was 15. By 1843, he had made a living for himself as a professional painter. In 1861, he joined the Union army and fought in eleven battles throughout his time in service. His best-known works are a series of five oil paintings detailing the battle of Antietam. The painting shown here is titled The Aftermath at Bloody Lane and depicts the carnage after Antietam. The line of dead stand in stark contrast to the lush countryside and the painting serves to highlight the terrors of war. Much of the nation viewed war as glorious and honorable, but Hope’s paintings show the true horror of the death and destruction wrought by violence. His art served to disabuse many of their false ideas about the reality of war (Flood). John Curry was born in 1897 on a farm in Kansas. He attended a local art school and went on to work as an illustrator. His work was well received and in 1937 he was commissioned to paint murals throughout the Kansas State Capitol. His works sparked controversy both due to their portrayal of the sensitive subject matter. Curry stopped his work in 1942 to protest the materials he was given and the murals were never signed as a result (“John Steuart Curry”). Curry’s most famous mural Tragic Prelude is also one of his most controversial. 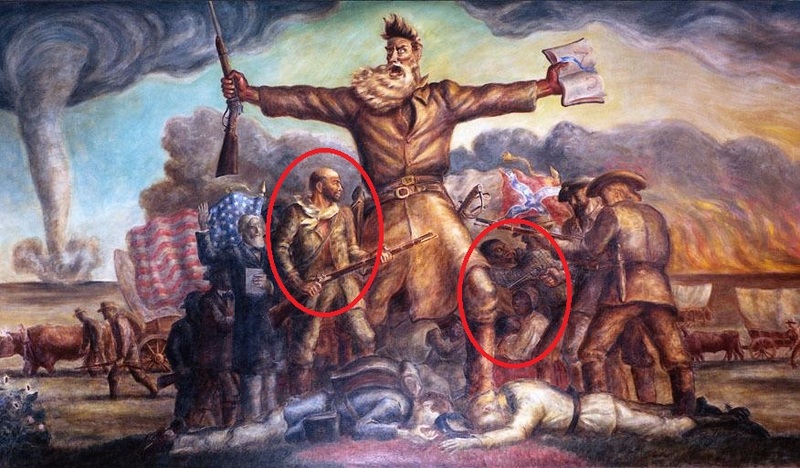 It depicts John Brown standing between the Confederate and Union armies. Brown’s ferocity is clearly shown, with his hair wild and his face set in a look of stern reprimanding. He holds a Bible in one hand and a rifle in other, portraying how the righteous cause of antislavery went hand-in-hand with violence. The Union army is standing tall and noble while the Confederates are hunched and violent. The tornado and fires in the background represent the horrors of war and the chaos that it reaped on the nation. At Brown’s feet lie dead soldiers, showing the true cost of freedom. Perhaps the most interesting feature of the mural is the portrayal of blacks on either side. The black on the Union side stands tall at the front and is armed, prepared to fight for his rights. The blacks on the Confederate side cower in fear from the angry whites that surround them, forcing them to fight for something they don’t believe. Overall, Curry’s mural can be quite disturbing and shows some hard truths about the nature of the Civil War. His art is not simply aesthetic but also has a deep symbolism (“Tragic Prelude”). These artists were well aware of the powerful tools of persuasion they held. Each of them tried to convey different messages about the Civil War, but they were all trying to teach their audience something. They tried to debunk common misconceptions held by the public about the conflict. Curry portrayed those who fought for the Union as very heroic, similar to how many Irish artists portrayed the leaders of the Rising. Hope was well aware of the desolation caused by the fighting and depicted the terrible tragedy of the event in a powerful way. This was different from many Irish Rising artists as they preferred to glorify the Rising and even when they did show the consequences of the violence, it was not often a focus of their piece. 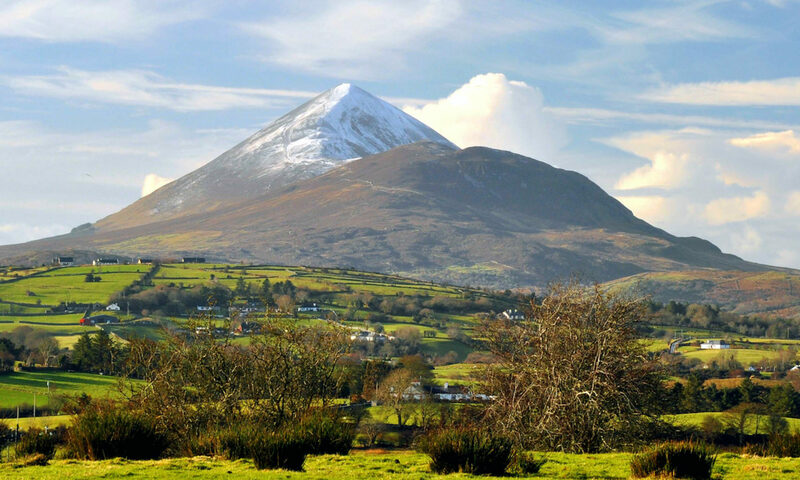 American artists were trying to caution others against such forms of violence, while Irish artists often hoped that someday similar events would take place more successfully.